Ford’s six-time international engine of the year, the 1.0 EcoBoost, is back in the EcoSport S along with a new 6-speed gearbox. We drove it to discover if the S badge makes it a machine just for weekend thrills or even for the daily drive. The Ford EcoSport S is based on the Titanium+ variant of the updated EcoSport range and receives just a few cosmetic tweaks and a sunroof to distinguish it from its siblings. There are mechanical changes in the petrol S too and it gets a new engine, with the 1.0 EcoBoost replacing the Indian-made Dragon series 1.5-litre unit. This is matched with a new 6-speed manual that takes the place of the 5-speed that came before it. The diesel S will also feature the same 1.5-litre diesel as before with a 5-speed manual transmission. Another addition to the EcoSport range is a new Signature edition trim package that further expands the EcoSport family. Yes, this does sound confusing so read on as we unravel all the details. The S receives slight cosmetic changes to distinguish it from the rest of its family. The first thing that you notice is that all the chrome is missing, replaced by dark, matt-finished surfaces. This is prominent on the grill face and around the headlights and fog lamps. The headlights have also been updated to bright HID units which feature smoked lenses. The roof and roof rails are painted black and the new 17-inch alloys are also in smoked grey, which gives the SUV a custom look that does make it stand out. Inside the S the changes are similarly minimal. The instrument panel and the seats get orange accents that do a good job of breaking up the all-black interior. The SYNC3 touchscreen dominates the dashboard and is a big improvement on the the Ford interiors of old. Even the driver’s instrument cluster feels proper modern with the new 4.3 inch display. The wider front seats and the updated cushioning are comfortable all round but the rear armrest folds down a little low and is not usable for taller passengers. The S gets the excellent 8-inch SYNC3 touch screen infotainment system. Its screen is bright and responsive and Ford’s third-generation SYNC interface is intuitive and easy to operate. It features the now obligatory Android Auto and Apple CarPlay as well. We did complain about the tiny information display in the driver’s instrument cluster on the facelifted EcoSport but this has been fixed with a larger 4.3 inch unit now. It is much easier to see on the move and allows you to adjust features such as Hill Assist, auto headlamps, and also displays the tyre pressures from the tyre pressure monitoring system or TPMS. In fact the EcoSport S actually steals the TPMS system from the Titanium + variant, which won’t receive this feature anymore now. In addition to rain-sensing wipers and automatic headlamps the S also retains the Titanium +’s excellent keyless entry system which we really liked. It also has another trump card over the Titanium + variant: a sunroof. 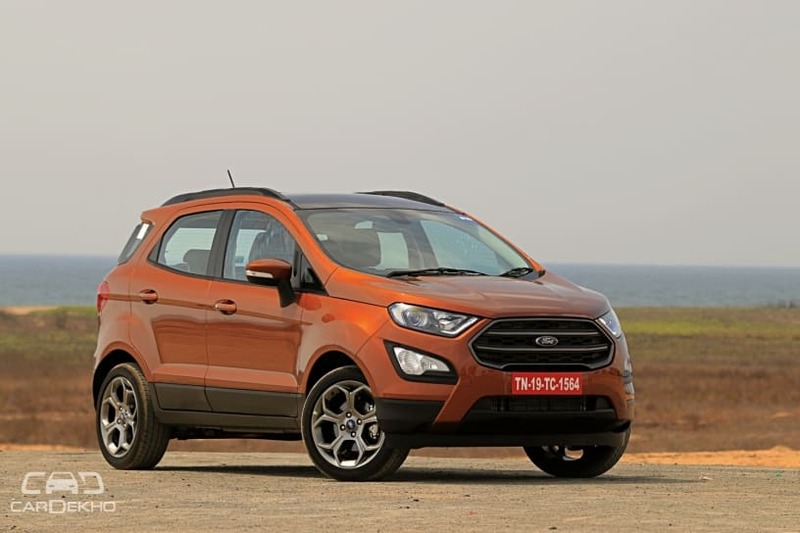 Yes, Ford admit they have given in to customer demands and equipped the top end EcoSport with a feature customers prefer, even over safety features like more airbags. So who is the Signature edition for? Further expanding the EcoSport family is the Signature edition. This is based on the Titanium trim of the Ecosport launched last year. It sits just below the Titanium + edition and misses out on features like Ford’s My Key, SYNC3 and cruise control, and also comes only with driver and passenger airbags. Surprisingly, it is the Signature that gets a spoiler and not the S! It wears chrome instead of the matte black finish on the S. And also gets 17” alloys in a different diamond-cut design. Inside, blue stitching on the seats and blue trim accents on the dashboard add some colour. It will also feature its own 9-inch touchscreen that is larger than the range-topping S, but made by FlyAudio. It mimics the SYC3 theme but misses out on Android Auto and Apple CarPlay. The Signature version is available as an optional kit on the Titanium variant for a premium of Rs 85,000 and it also features the new sunroof. It’s perfect for those who don’t see the need for the other optional extras that the Titanium + and the S offer, but just can’t do without a sunroof. Engine and Performance Powering the EcoSport S petrol is the renowned 1.0-litre EcoBoost turbo petrol engine. It makes 125PS at 6000rpm and 170Nm between 1500-4500rpm. What’s remarkable about the EcoBoost is its refinement: at idle and constant throttle it’s practically silent, with very little engine noise or vibrations creeping into the cabin. But step on the throttle and you will be greeted with a throaty engine note which you can either love or hate. Personally, I quite liked the thrum of the little three-cylinder engine. It’s a very nice engine to drive around town because the power comes in from very low in the rev range and stepping on the throttle in third or even fourth gear from as low as 1600rpm brings about smooth acceleration. It’s when it comes to driving in a spirited manner that things change up a little. One of the characteristics of an enthusiastic or sporty engine is its top-end power delivery, and while the EcoBoost has an excellent midrange kick, power and torque tend to drop off post 5000rpm, encouraging you to shift up early. And this tends to spoil the mood a little when you want to thrash the S on a nice open road like the ECR. The early shifts almost encourage you to drive in a sedate manner and that’s not quite sporting. That said it’s still an engine that’s suited to a much wider range of conditions and we feel this will appeal to a larger audience. Ford also claim that it will return 18kmpl while also reducing emissions by up to fifteen per cent. The new gearbox is a delight to use, with shifts slotting smoothly, and it’s paired with a reasonably light clutch action. That said, with the tractable motor you don’t really need to use the gearbox that often and I found myself even skipping ratios while shifting up, using the driveability of the engine to drive a taller gear. On the diesel front the 1.5-litre motor in the S makes the same 100PS and 205Nm as before and is great for everyday driving - as there is no suddenness in power delivery, it’s strong from the word go. Even when turbo kicks in the surge is very mild. As per the update in 2017 the claimed figures remain the same at 23kmpl, a good 3kmpl more than the pre facelift version. Contrary to speculations Ford hasn't made any change to the suspension setup or the dynamics of the EcoSport S. Ford say that further stiffening of the setup would just make the ride quality quite unbearable on our roads. And we can’t blame them as we did quite like the new setup of the 2017 update. It’s still a firm setup but the crashiness from the pre-facelift car has disappeared. Only really sharp bumps like level changes and rumblers make their presence felt in the cabin. We appreciated the quiet cabin of the new EcoSport and with the quiet EcoBoost it’s even quieter while cruising. The nicely weighted steering is quite responsive around town but, as can be expected, the tall boy design exhibits some body roll during quick lane changes at highway speeds. This got us thinking - what if Ford decided to drop the ride height, add some sticky tyres instead of the Bridgestone Ecopia 205/50 R17s, and gave us an RS version? With the new features and the slight visual tweaks Ford has managed to add considerable value to the S version, even if it’s not quite the weekend thrill machine we were expecting. The new Ecosport S has been priced at Rs 11.37 lakh for the turbo petrol and Rs 11.89 lakh for the turbo diesel. This makes both of them Rs 85,000 dearer than the Titanium + trim they are based on. Choosing the EcoBoost will give you a nice and refined petrol that is great for commuting as well as munching the miles. The diesel is an equally personable engine as well and just the cost of the sunroof, the HID headlamps and the new instrumentation should justify the price premium for both cars. And if you really must see the sky through the roof, the Signature edition skips the bells and whistles of the top-end variants and offers a sunroof at a much lower price point.